Most states prohibit rebates and have made many inducements illegal. That is paying, allowing, giving, or offering something that is not specified in the contract as a way to induce the purchase of an insurance contract. 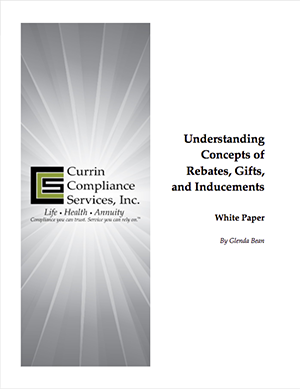 When something is considered a rebate or inducement varies from state to state. Some states provide additional guidance about what the statutory language means, but not all states do. For many, the law is the only guidance. There are two states that are the big exceptions to the rule when it comes to rebating. Florida and California. These two states do not prohibit rebating, although there are differences between them. There are some innovative programs under discussion and in the early stages of implementation that may test some of these long-standing rules and norms of the industry. This is likely to result in re-thinking some of these old standards. If a new idea for a program lands on your desk, we've provided some analytical tools in this white paper that may be helpful to you as you grapple to determine whether such a program fits within the regulatory framework. The biggest challenge is the lack of specific guidance in many states. Download our free white paper to learn more.